There are a wide variety of rugs on the market these days. From long pile to short pile to flatweave rugs, there are rugs to suit every budget and home décor design. From new style rugs to antiques, there is a wide range of rugs to discuss. Join the team at Woods Rug Laundry as we discuss the Kilim rug. The kilim rug is a flat, tapestry style rug which traditionally comes from Iran, Turkey, North Africa, the Balkans, the Caucasus, Afghanistan, Pakistan, Central Asia, and China, to name a few. Traditionally kilims were purely decorative rugs or used as prayer rugs. Modern versions of kilims, however, are popular in western countries as floor rugs. Kilims are generally cheaper than pile rugs so they’re popular for beginner rug collectors, despite the fact many might see them as inferior to pile rugs. In fact, recently, kilims have seen a revival and have become increasingly collectible, with authentic village weaving commanding high prices. 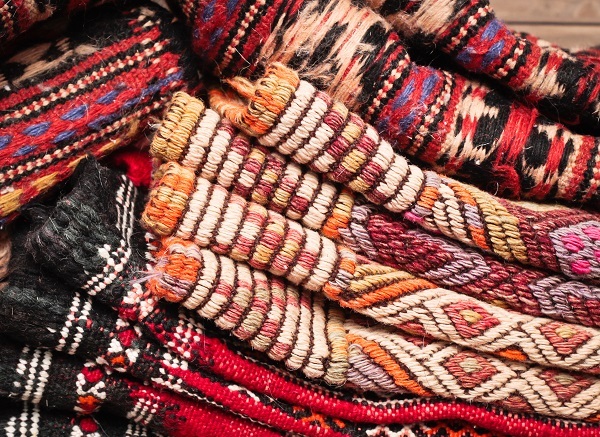 What is a Kilim Rug Made From? Kilim rugs are made using a variety of different primary materials. These can include cotton, silk, wool and other animal hair such as goat, camel or horse. Gold or silver thread, beads and other decorative items are also used but rarely. Wool is generally the primary – and only – material used in making a kilim rug. 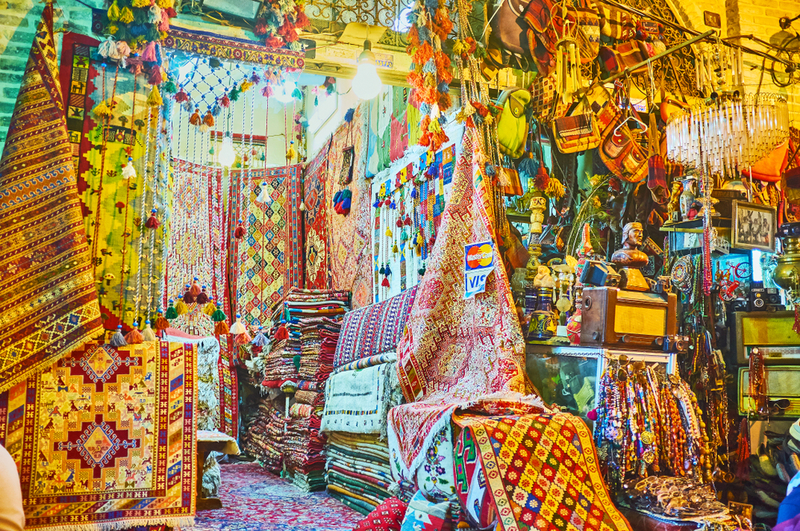 Many rugs are made entirely from wool, including both warps and wefts. This is due to the fact that wool is supple, durable, handles easily, easily takes dye, and is in plentiful supply. Cotton is often used as the warps in weaving a kilim rug due to its strength and supply. Further, it keeps its shape well, retains whiteness, and can be spun into fine, thin strands. It is also commonly interwoven into the rug to highlight certain aspects of the kilim design. Animal hair is another popular addition to kilim rugs. It is used sparingly but when it is used, it is done to good effect. Camel hair is strong and durable and, when available, it is sometimes used to give added strength to woollen rugs. The mane or tail hair of a horse is used by some nomads to provides decorative fringes or tassels to kilim rugs. Finally, goat hair is commonly woven into nomadic rugs as some varieties – like mohair – give a softer, silky sheen when mixed with wool. Turkish kilims sometimes feature silk, but these are increasingly rare as silk was – and remains – a luxury material. Bridal dowries that included silk kilims were treasured and regarded as status symbols. What is the Difference Between a Kilim and a Pile Rug? The biggest difference between a kilim rug and a pile rug is how the designs are made. On a pile rug the designs are made by individual short strands of different colours knotted onto the warps and held together by pressing the wefts tightly. Kilim rug designs are made by interweaving the variously coloured wefts and warps, creating what is known as “flatweave”. 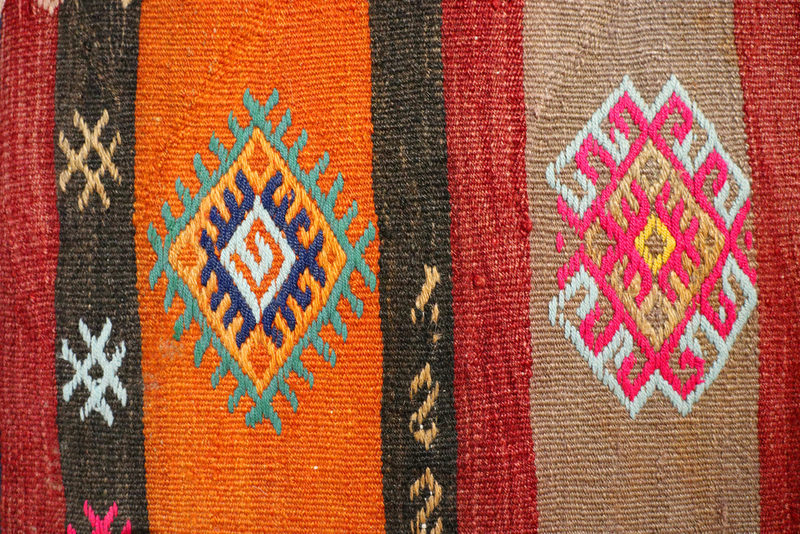 Kilim rugs can also be made using the slitweave technique. This refers to the gap left between two blocks of colour in a rug design. It is created by turning the weft around the last warp in a colour area. The weft of the adjacent colour is later returned around the adjacent warp. Further, kilim rugs come in a variety of designs, including diagonal patterns to avoid weakening the structure of the vertical slits. Weavers also enjoy creating stunning geometrical designs though there are some kilims bearing beautiful floral patterns too. How Do You Clean a Kilim Rug? 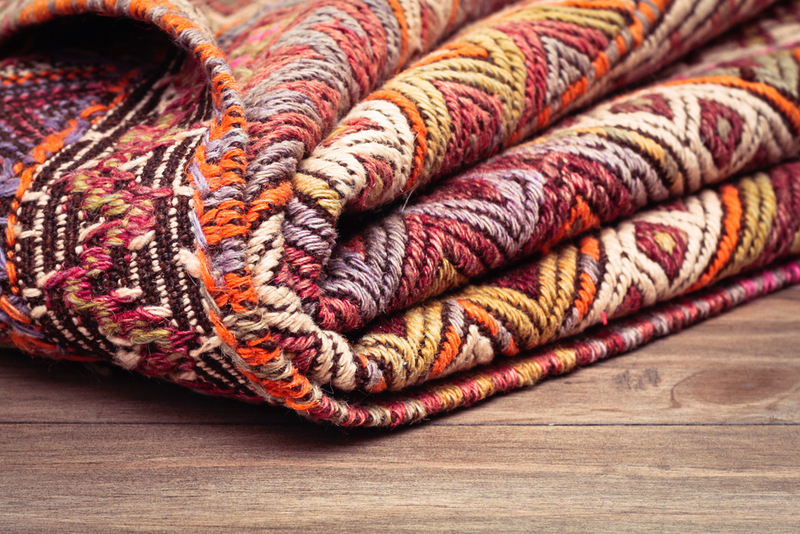 Caring for a kilim rug requires special treatment to avoid damaging the delicate fibres. They need to be cleaned by hand and vacuumed gently to avoid irreparable damage. Anything more than day-to-day cleaning should be done by professional rug cleaners. General cleaning should be done by gentle hand sweeping. You should sweep both sides of the rug to remove any loose debris. Gently run a broom over the entire surface and then flip it over and brush the other side as well. Make things easier on yourself by ensuring the rug is on a flat surface. A hand broom or a handheld brush is safer as it offers more control as is less likely to cause damage to the fibres. You should vacuum a kilim rug weekly to avoid scrubbing the rug. This way you will keep it free of dirt and dust. It is extremely important to use low suction only and never use a revolving brush. High suction and/or revolving brushes can cause the delicate rug to tear or rip the rug. If you have a handheld vacuum, this is the best option for vacuuming a kilim as they are powerful enough to clean but not powerful enough to damage the rug. Vacuum both sides of the rug each time. This is because a kilim rug is hand knotted and does not have a backing like other rugs do. Further, avoid vacuuming the delicate fringe as it may snag and unravel. If, for any reason, you spill anything on your rug, it is important to carefully blot the stain and remove any solids. Once this is done, you should book your kilim rug into a professional cleaner as soon as possible. Because kilim rugs use a range of natural and artificial dyes it can be dangerous to use off-the-shelf cleaners as these can cause dye run and damage. A professional cleaner can spot test and carefully clean a delicate kilim rug in order to prevent dye-run occurring. We have had many people ask us what the difference is between a kilim rug and a dhurrie rug. And the answer is – not much! While these are two different rugs, they actually use very similar weaving techniques. As a result, in the modern era, dhurrie and kilim are almost interchangeable terms. Before the 1970s, kilim rugs and dhurrie rugs were created in different regions. However, this is no longer true. Traditionally kilim rugs were boldly coloured with geometric patterns while dhurrie rugs tended toward more pastel tones with flowing stylised designs. However, both are beautiful, flat woven rugs generally made from wool and are completely reversible due to their weave. While these differences still work to tell the differences between kilim rugs and dhurrie rugs, many stores and cleaners will still use the terms interchangeably. Do you have a kilim rug that needs cleaning? Contact the team at Woods Rug Laundry today for more information on our professional rug cleaning services!